DM16 allows users to chose one of 30 teams or select a new city location to develop. 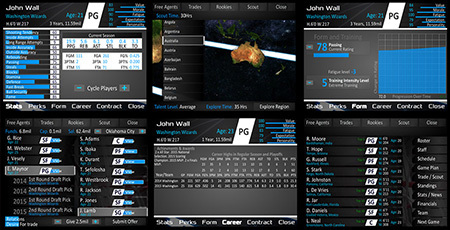 Once selected Trade, Draft, Sign free agents and drop players to build your ultimate team. Keep the crowds coming in with star players, high scorers, great passers and amazing rebounders. Make upgrades to the stadium, transport or scouts and get benifits with each. Fight through the playoffs for the ultimate goal of winning a championship. All this and more!